While you can grow crops in We Rule, it's a shame you can't invade your friends' kingdoms and pillage their food supply. 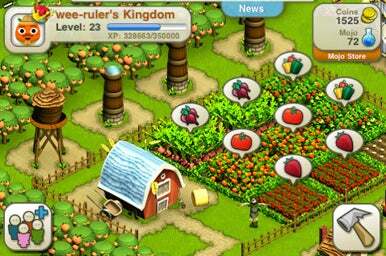 The concept of the game shares many similarities with the popular facebook game Farmville. Each player chooses an avatar and then can grow crops at a profit, choosing different crops by their yield in gold, xp (experience points) and growing time. Growing times range from 45 seconds for corn to longer 24 hour periods for green beans. Profit from crops can be used to buy more farmland, more crops, and structures to fill out and decorate your kingdom. An extra material called "mojo" accumulates as you reach each new experience level. Mojo can be used to hurry buildings under construction or to shorten growing times. For example, a quick way to pick up a lot of extra cash is to plant the most profitable crop (green beans) and then use three mojo points to harvest it instantly. More mojo can be bought from We Rule for real money if you’re the type of person who gets impatient with slower things like boiling water or sunsets. All of these game concepts are fairly easy to pick up, thanks to a little wizard that coaches you and establishes goals for the first few levels. We Rule offers enough distractions to be a stand-alone game through its kingdom building capabilities, which are the most fun part of the process. Profit from crop sales can be used to buy houses for your villagers, roads to connect them and trees, rivers and fences to decorate them. Rather than being extraneous decorations, these improvements give you additional experience points and draw new villagers to your kingdom. As the structures and decorations of your kingdom improve and expand, more and more people can be seen walking around—adding a fun, bustling feel to the screen. The more advanced your structures and decorations, the more interesting your kingdom becomes. With the addition of a pond, a giant frog prince comes to hop around your kingdom, and the addition of a bakery adds a friendly baker. We Rule has a lot of strengths: the game interface is interesting and colorful and your crop and kingdom decoration options and combinations are almost endless. The game works pretty well within the iPhone operating system – I was able to play while listening to the iPod or talking on the phone. An optional push notification alerts you to each time your crops are ready so they don’t spoil from lack of harvesting. The major drawback that I dealt with was that the load screen for We Rule takes forever. Yet, taking into account the simple, but masterful game concepts and interface, We Rule is worth the wait.